I don’t normally cover cleaning stuff here on the site, but when it’s something you can wear – I need to review it. There’s nothing quite as satisfying and refreshing as a good weekend or beginning-of-the-month house cleaning session. You can’t scrub away regrettable decisions or disappointing relationships, but you can certainly scrub your way to a clean house. Arguably a neat, organized living space is the thing most under your control. If you’re in a hurry, you can head over to Amazon to check out my top pick, the Hoover Commercial Lightweight Backpack Vacuum, right now! Lucky for you, I’ve taken all these considerations into mind for you and compiled a convenient list of my top recommendations. 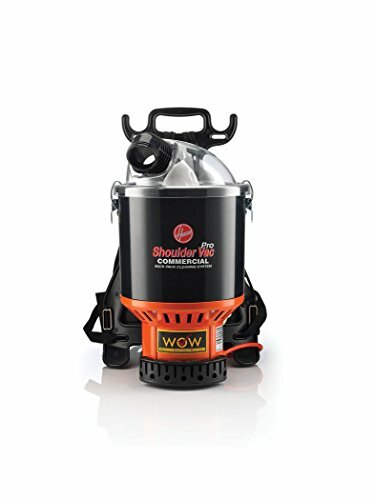 If you’re looking a versatile backpack vacuum to use in a variety of situations, or just our opinion on a best choice overall, the Hoover Commercial Lightweight Backpack Vacuum is your Goldilocks. At 9.2 pounds and a 66 dB sound level, this Hoover has a 6.4 qt capacity, so it’s not too big, not too small. The adjustable harness was specially designed by chiropractors in order to minimize user strain and maximize the machine’s portability. So you can be sure that this backpack vacuum was designed with your comfort as a priority! So it’s lightweight, quiet, and comfortable. Is it powerful enough and accessorized for a larger-scale or commercial setting? The 48-foot power cord means that you’ll have to change outlets less often. Tools included are a 60” hose, a 38” straight metal wand, a crevice tool, a turbo floor tool, a dusting brush, and an upholstery tool. With the Hoover Backpack Vacuum, you’ll be sure to accomplish a detailed cleaning that gets to every nook and cranny. And with the HEPA cone-shaped filter that traps particles as small as 0.3 microns, you can be sure it’s a high-quality clean. Ready to start vacuuming? Head over to Amazon to check out more info and get one for yourself! Say you’re looking for the top-of-the-line, gold-standard backpack vacuum, what the pros use (maybe you literally are a pro). In this case, the ProTeam Super CoachVac 10-qt Backpack Vacuum is for you. Ideal for commercial use (but also great for home), the Super CoachVac features an ergonomic, easily-adjustable harness that makes vacuuming as comfortable for you as possible. The adjustable straps allow you to ensure that the weight of the vacuum is uniformly distributed around your own center of gravity to make it easier for you to balance. Additionally, the harness is equipped with a tool belt that will hold all the accessories in an easily accessible position. And the accessories certainly are impressive! With tools like a telescoping wand, soft dusting brush, upholstery tool, and crevice tool, you’ll be equipped to effortlessly clean your entire space, floor (hardwood, tile, or carpet) to ceiling, and all the furniture in between. To top it off, the 50-ft power cord will reduce the number of times that you’ll have to relocate your source of power. What about weight and noise level? 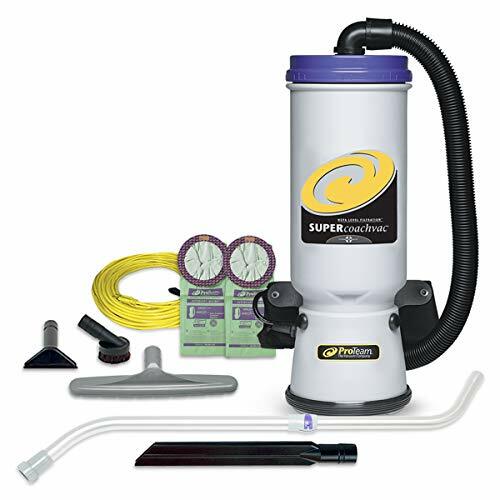 The Super CoachVac, a powerhouse of a vacuum, sacrifices neither of these for its impressive performance. This model manages to fit in its four-level filtration system and 1188-watt motor into a mere 11-pound- backpack. And at only 66 dB (think conversational level! ), it is one of the quietest professional backpack vacuums available. Find out more about this awesome commercial vacuum by clicking over to Amazon to see for yourself. If you’re in search of something a little smaller and/or budget-friendly, perhaps just for personal home use, we’ve got you covered. 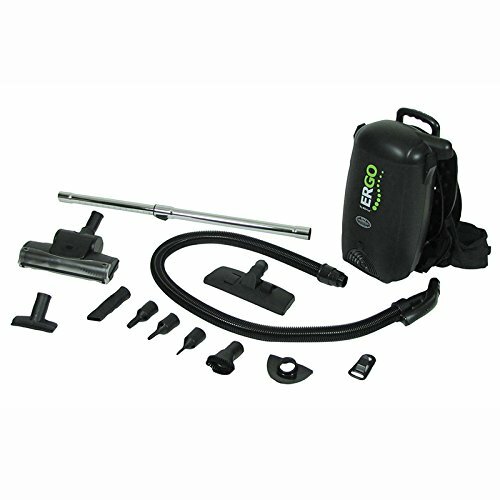 The Atrix HEPA Backpack Vacuum features a similar high-quality, 4-level filtration system and an 8-qt capacity. It, too, has adjustable shoulder straps and a tool belt loop so that the fit of the backpack can be customized for your personal, maximum comfort. What’s more, the set-up can be converted to be optimized for both right- and left-handed users. If you’re a lefty like me, you’ll appreciate this attention to detail. In terms of vacuuming power, you still want the best for your home! And you’ll get nothing less from the Atrix. With accessories such as a flexible 6-foot hose, a metal wand that extends to 37 inches, and 8 different nozzle attachments, you can ensure that every corner of your home is allergen- and dust-free. The backpack portion of the vacuum weighs just over 10 pounds, and customer reviews have expressed satisfaction with its low sound level. Look forward to effortless, quiet cleaning! You can read more about this great vacuum over on Amazon by clicking here. Why should I choose a backpack vacuum? Backpack vacuums are an ideal choice for several reasons and for every scenario and lifestyle. If you live in a smaller apartment, backpack vacuums are easy to store, especially as they’re more easily lifted up and tucked away onto a tall shelf in a closet. Additionally, they are easier to maneuver around corners, into tight spaces, and through narrow hallways. If you can fit into it, so can the backpack vacuum! If you live in or work for a larger place, perhaps one with multiple floors, the backpack vacuum is perfect for you, too! Because of its ergonomic design, this type of vacuum enables you to clean more efficiently, covering greater space in less amount of time. And the relative ease of carrying it up the stairs is noteworthy. No more dragging upright, wheeled vacuums up to the second floor, only to be faced, already exhausted with a whole floor to clean. Soon, you’ll be wondering why you don’t vacuum more often! What should I look for when choosing one? When choosing a backpack vacuum, be sure to pick one with adjustable straps. You’ll want to be able to fit the backpack portion snugly around your body in order to avoid bumping into furniture or walls while cleaning. Additionally, a comfortable, customizable fit is important so that you’ll be able to better maintain your balance and minimize strain on your back. Because your next favorite purchase is largely going to be carried on your shoulders for a pretty extended period of time, choosing a lightweight vacuum is also one of your top priorities. Even the most ergonomic harnesses can’t fix a vacuum that’s too heavy for you! Fortunately, thoughtfully designed backpack vacuums are, with this in mind, created to be light and compact, powerful but practical. But definitely keep this at the forefront of your mind when making a decision! Next, be sure to choose a quiet vacuum. While there’s nothing like a bit of comfortingly consistent white noise to clear your mind while clearing out your carpet dust, a machine on your back will be closer to your ears than one rolling on the floor. This means you’re more likely to be sensitive to (and annoyed by) higher-decibel backpack vacuums in comparison to a similar sound level in a regular, upright one. Your roommates or customers will also appreciate it! It’s time to get cleaning! Whether you’re a professional cleaner wanting an upgrade, a busy mom looking to streamline weekend chores, or a student searching for the most hassle-free way to occasionally do a little tidying, the backpack vacuum is for you. There are a variety of models to fit your exact budget range and cleaning needs. Don’t forget to prioritize backpack fit, pick a lightweight machine, and be mindful of sound levels! What are you waiting for? Vacuuming no longer has to be an exhausting process of inefficiently lugging around deadweight with your arms. Go find the backpack vacuum of your dreams and breathe easy. Our top choice from Hoover, is a great place to start. Got another choice? Leave it in the comments below!